The Counter Pr… Type Foundry. Sort of. A little print we've been planning for a while took a step closer to actually happening this week, as we finally managed to cast our very own type for it! We've always been fascinated with typographic detail and the history of language through type. One particular muse of ours is the pilcrow, an almost forgotten character that over the years has slipped from everyday use, but has never quite gone away. We thought that creating a print around this charming and intriguing little typographic chap sounded like a great idea, until we realised there was a slight stumbling block: we don't actually have any pilcrows. And as almost all metal founts still (easily) available don't come with them, we had a problem. The letterpress adage that "you can only print with what you've got" made itself painfully apparent. And so began a quest to track down this illusive sort. Having contacted the Type Museum in London, we managed to get them to strike our very own pilcrow matrices for Monotype Plantin in both 8 and 10pt – the main text faces that we currently hold. Once we'd received these beautifully engineered little moulds of bronze, the next challenge was to get them cast into useable type. And that would require a whole lot of machine, a pot of 700° molten metal, and more than a little specialist help. So last weekend we made our way to the wonderful Amberley Museum Printshop, where we occasionally help as volunteers, to meet 'Mono Mick' and the fabulous Monotype Composition Caster. Mono Mick, who was anything but monosyllabic, was a Monotype engineer and operator for over 50 years, and what he doesn't know about these wonderfully complex machines isn't worth knowing. He soon had our humble little 'mats' set in a die case and loaded onto the recently restored caster. After tweaking many screws, bolts, handles and levers like something from a Jules Verne novel, making tiny adjustments to the settings and endlessly checking and re-checking the individual pieces of test type, we were ready to cast. And when we say 'we', we mean Mick. Well, someone had to watch and take the photos! Soon enough the many pistons, springs, arms, and things we don't even have names for, were set into a percussive chorus of clicking and clacking, as our freshly minted type elegantly and effortlessly marched out of the noise and onto the awaiting galley. 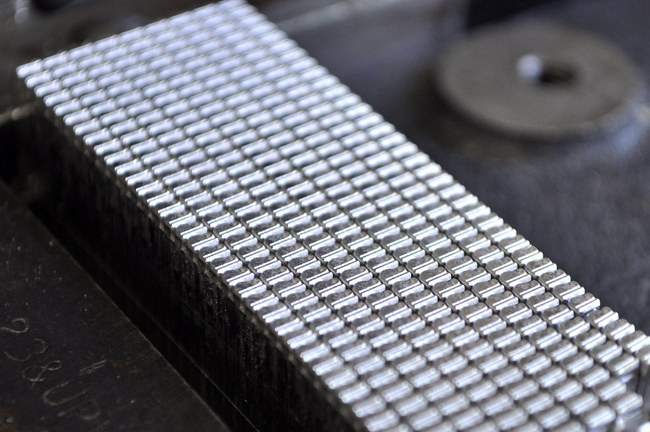 Perfectly formed little soldiers of lead, shiny and ready to print.